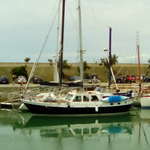 Here you’ll find travel reports about Saint-Denis-d'Oléron. Discover travel destinations in France of travelers writing a travel blog on FindPenguins. Yesterday we rode the North part of the island, we headed to the lighthouse Phare de Chassiron for a gawp before having some of the nicest coffee we have tasted here in France at cafe Vue de La Mer. Then we rode down part of west coast, on cycle track some of the way. (Only some of the way because as anyone who has tried to follow a French cycle route will probably be able to tell you occasionally the signs just stop). We stopped a few times to pick blackberries they were delicious. We passed through Les Huttes, Chaucre, and Domino before crossing the island to the east coast via Cheray and St George d'Oleron to the Port of Le Douhet for a galette John was on his last legs. Then back North passing through Les Boulassiers and La Brie les Bains to get back. As I got bored later I baked fruit cake and bread rolls.